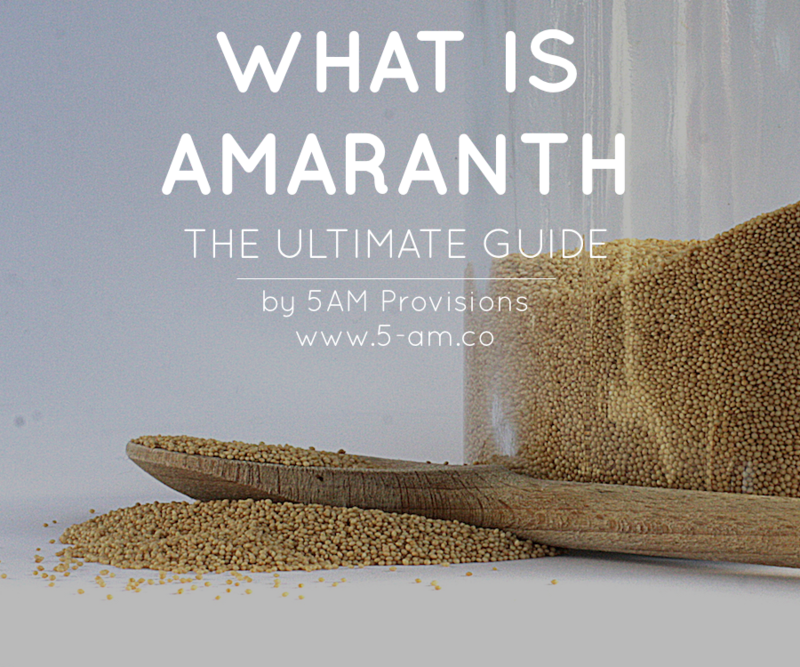 What is Amaranth - The Ultimate Guide 5AM Provisions, Inc. This guide will tell you what amaranth is, its history, recipes, health benefits, and why it will become an important staple food. Everyone is talking about ancient grains and gluten-free foods, if you already know quinoa, you need to know about amaranth. Amaranth is a protein packed superfood that will change our perspective of the complete food system. If the phrase “you are what you eat” is true, everyone should be amaranth. No matter what your background is, this guide will help you to understand what amaranth is and will tell you how you can utilize amaranth into your everyday diet. Amaranth is an excellent food for a vegan diet, for people who have celiac disease or for people with gluten sensitivity. Our goal is to give you a guide that will save you time from researching online, it will explain terms like gluten-free and squalene, and will provide you how-to tutorials such as "How To Cook Amaranth" or "How To Make Popped Amaranth." This is your one-stop-shop to find out the benefits of amaranth. To help you learn on specific topics, we’ve created an interactive table of contents. Click each link to go directly to a different section. Click here to download "What is Amaranth - The Ultimate Guide" as PDF. Amaranth is the collectively known name for amaranthus. There are over 60 different varieties of amaranth, most of which are considered as pigweed. Here is a list of all the different amaranth varieties. Amaranthus cruentus, Amaranthus hypochondriacus, and Amaranthus caudatus are the three most common species that are grown for their edible seeds. The word “Amaranth” comes from the Greek “amarantos” and means Unfading Flower. Amaranth can grow up to 6 feet, has wide broad leaves, and beautiful gold, red, or bright purple flowers. Each flower head produces an astonishing half a million seeds and can weight up to 1kg (2.2 lbs). Amaranth is actually a seed, even though we are often referring to it as a grain. To be more accurate, amaranth is a pseudo-cereal. It doesn't belong to the traditional grain families such as wheat, oats, or sorghum. We are referring to amaranth as a grain, because we use it like one. From a biological perspective, cereal grains are part of a group called monocots, and are the seeds of grasses. Pseudo-cereals or pseudo-grains are the seeds of broadleaf plants, belonging to a group called dicots. Some other pseudo-cereal examples are quinoa, buckwheat, and chia. Amaranth can be grown almost anywhere. While it is native to Central America, it is commercially and locally grown all around the world. Most of the amaranth that we eat today is coming from India or South America. Amaranth can easily grow organically and does not require much water. In fact, amaranth is an amazing drought resistant plant and can be utilized in areas where water is limited. Amaranth is a superfood, gluten-free, and it's often recognized for its abundant nutrient richness. Amaranth has a complete protein profile, meaning it has high amounts of all of the nine essential amino acids, especially in lysine - an essential amino acid that is lacking in most plants. There is one important characteristic that makes amaranth stand out compared to anything else - it has high amounts of squalene! Amaranth is the highest plant-based source of squalene. Squalene is a nutrient that has shown many amazing health benefits. QUICK FACT: Thousands of sharks are killed every year for their squalene. Amaranth has the potential to stop the killing of sharks and can contribute to preserving biodiversity. More on squalene later. Amaranth can be used as grain, as flour, it can be popped like popcorn, it can be used as a leafy vegetable like spinach, and it can also be used as cold-pressed oil. Regardless how it is used, Amaranth provides many health benefits. Amaranth has a long and somewhat bloody history, dating back to over 7000 years ago and to the ancient Aztec civilization. Amaranth is considered as a native crop in countries like Peru and Mexico. The term “Ancient Grain” describes grains that date back to the beginning of time. Ancient grains have been unchanged over the past hundreds of years. Modern grains, such as wheat, have been constantly changed and bred for modern agriculture. Some of the ancient grains are: Amaranth, Spelt, Quinoa, Chia, Kamut, Sorghum, Teff, Millet, and Farro. Amaranth grain was a staple food to the ancient Aztecs. The Aztecs didn’t only grow amaranth as a source for food but also used it in many religious practices. They would take a combination of amaranth and honey to create a pictures of their gods. Those pictures made of amaranth and honey were worshiped and then broken into pieces for people to eat. The Aztecs also ate amaranth before going to wars. Amaranth gave them the power, strength, and energy to travel and fight wars. The ancient history of amaranth ended when the Spanish conquest arrived in the New World. Cortez defeated the Aztec empire and claimed Mexico for Spain. With the defeat of the Aztec, Cortez quickly outlawed the use of foods that were used for religious ceremonies, including amaranth. Everyone that was found to grow amaranth was punished. Amaranth’s growing characteristics made it difficult to fully destroy it. 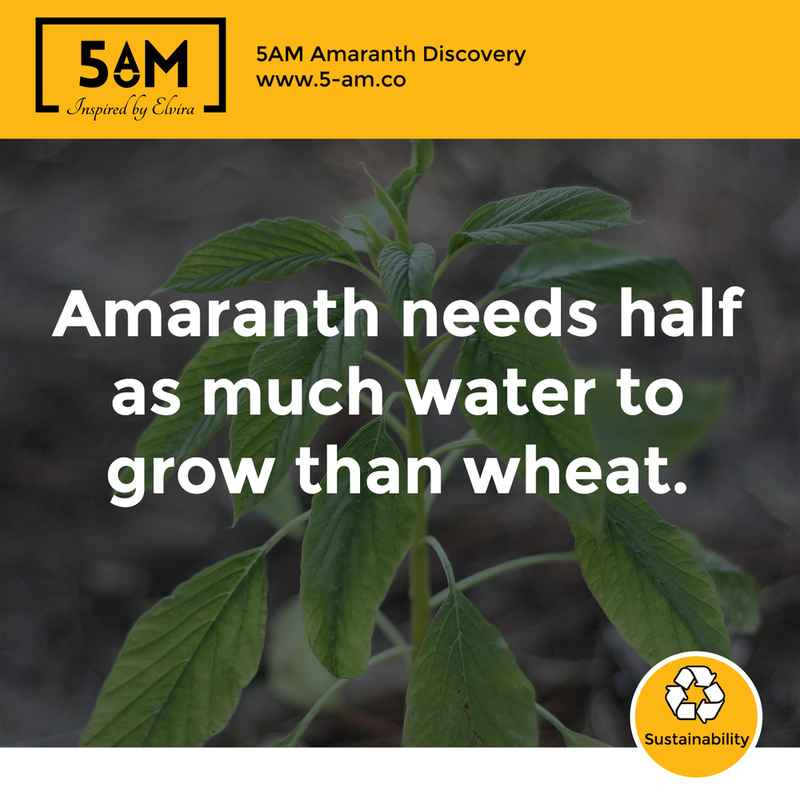 Amaranth is growing quickly without use of much water, and survived in remote areas of the country. Hundreds of years later, in 1950's, U.S. agronomists started to research amaranth for its nutritional values but also for the benefits of a quickly growing plant without the use of pesticides and much water. 2050, 9 billion, food shortage, water consumption, poverty, global warming, etc., are all keywords that many people discuss today. One of the biggest problems of the century is how and what we are going to feed 9 billion people by 2050. Amaranth is the answer to the piece of the puzzle to feed 9 billion people by 2050. The world population will grow from 7 billion people to over 9 billion people by 2050. To feed over 9 billion people, food production needs to increase by 70%. It takes 1700 gallons of water to produce 1 pound of beef. We only have 0.007% fresh water readily accessible for direct human use. 90% of all large fish are going to disappear from the ocean ecosystem. If we continue to eat seafood at current rate, then we might not see any fish in the oceans by 2050. Consider all of the facts above & now add chemicals wherever you can (basically everywhere): pesticides, hormones, GMO’s, radiation, etc. This is the real world where we currently live in. Amaranth is nutrient dense, providing high amounts of important minerals and vitamins. Amaranth has a complete protein profile, enabling you to eat less meat. This means: we will save water for the production on meat. This means: we will reduce the livestock greenhouse gases. Amaranth can be grown organically with half as much water than wheat. Amaranth oil contains squalene, a nutrient that is traditionally extracted from deep-sea sharks. This means: saving millions of sharks annually, an important component of the ocean’s ecosystem. Amaranth has shown many impressive health benefits. Agriculture will become important in the sub-saharan countries where poverty and malnutrition is predominant. Amaranth can provide smallholders family farmers and surrounding communities with a healthy food source and extra income. A complete protein is defined as a source of protein that included all of the nine essential amino acids. Most proteins that are derived from plants are typically lacking in one or more essential amino acids, amaranth is an exception. Amaranth is a good source of polyunsaturated fatty acids (PUFAs). Click here to see the complete Nutrition Facts. Several studies suggest that diets high in saturated fats, for example animal protein or dairy products, correlate to an increased risk of cardiovascular disease. Replacing saturated fats with unsaturated fats will help to increase HDL (good cholesterol), which helps in preventing CVD (cardiovascular disease). Other foods with unsaturated fats include: Raw nuts, avocado, flax, amaranth oil and olive oil. The main function of calcium is to provide structure for our skeleton. Our bones are constantly being rebuild, making calcium essential for the development of bones and teeth. Calcium is also necessary for a healthy heart, hormone secretion, and nerve transmission. Calcium is even more important for children because their bone structure is developing. Without the calcium in the diet, from sources like Amaranth, bone structure could be compromised, leading to osteoporosis over time. Iron is an essential mineral for the transport of oxygen through the blood in our body. A deficiency of iron limits oxygen delivery to our cells, resulting in decreased immunity and fatigue. Supplying the body with the daily intake of iron will support the growth of cells and strengthen the immune system. Manganese, like other minerals, is an essential trace mineral for many body processes. It supports bone health, required for the production of enzymes for the metabolism of proteins and fat, and helps maintaining blood sugar levels. Magnesium is an essential mineral for good health. Magnesium is a cofactor in more than 300 enzyme systems that regulate reactions in our body including protein synthesis, muscle and nerve function, blood glucose regulation, and blood pressure. Magnesium helps maintaining a regular body temperature, is necessary for energy production, is utilized for detoxification, and enhances the formation of healthy teeth and bones. Zinc is necessary for the proper function of the immune system and is required for over 100 enzymatic reactions. Zinc doesn't have a dedicated zinc storage system in our body, it is therefore required to have a daily intake of zinc. Zinc also supports normal growth and development during pregnancy, childhood, and adolescence, and involves in normal function of the prostate. Our livers produce squalene but as we age, the squalene production decreases. Do you know the feeling of being exhausted after playing with a child for a few minutes? If you do, you always ask yourself where they get the energy from. Children produce more squalene, which helps to transport oxygen throughout the body - giving them more energy. It is challenging to be vegan today. Lots of people that are on a vegan diet are also on a dairy-free diet, making it even more challenging to get the necessary proteins and minerals for the day. Introduce amaranth to your diet and you will have one less worry. Amaranth has a complete protein profile, which means it contains all nine essential amino acids and is especially high in lysine, an amino acid that is lacking in most grains. There it is, you are able to cut out the steak, turkey, and chicken, and still get all the protein you need. 1 cup of amaranth (193g uncooked) has whopping 14.7mg iron (82% DV), 6.4mg manganese (322% DV), 307mg calcium (31% DV), 479mg magnesium (120% DV), and 5.5mg zinc (37% DV). Get your proteins, minerals, and vitamins in the morning. Most gluten-free products are made of ingredients that won't cover your daily need for proteins, minerals, and vitamins. They are made of refined grains such as potato, corn, rice, and tapioca. In a survey from 2013, over 30% of adults are interested to completely cut or avoid gluten in their diet. Cutting out gluten from the diet, doesn’t necessarily mean eating healthy. To have a healthy gluten-free diet, it is vital to include foods like amaranth. Amaranth is a naturally gluten-free grain, making it an excellent choice for those following a gluten-free diet. Gluten is general name for the protein found in wheat (durum, emmer, spelt, farina, farro, and einkorn), rye, barley, and triticale. It is not tolerated for those who have celiac disease. Statistics indicate celiac disease (CD) affects at least 1% US population, which translates to nearly 3 million Americans. Celiac disease is the most prevalent genetic autoimmune disorder in the world. Currently, the only treatment for celiac disease is the gluten-free diet. Gluten-free substitutes include: amaranth, quinoa, potato, corn, tapioca, rice, millet, sorghum, and buckwheat. Celiac disease is an inherited autoimmune condition that affects absorption in the small intestine, specifically the upper portion, called the duodenum. A person with celiac disease, eating wheat, barley, or rye, will have a different response from his/her immune system through which it attacks the small intestine and inhibits the absorption of important nutrients, specially calcium, iron, and fat-soluble vitamins. The Celiac Disease Foundation is an amazing resource to dig deeper into all things gluten. There are lots of foods that deserve to be acknowledged with anti-cancer properties, amaranth should be included on top of your list. In addition to amaranth’s impressive nutritional profile, the one nutrient that makes it exceptional is squalene. Amaranth has the highest plant-based source of squalene. Amaranth seeds have on average an oil content of 4-8%. Within the cold-pressed amaranth oil, there is on average 4-8% squalene. The second highest plant-based source of squalene is olive oil, with amounts of 0.4-0.7%. Read “The Science Behind SQUALENE - The Human Antioxidant” for an in depth study of squalene. The results of the present study show that amaranth oil can reduce the amount of cholesterol in blood serum and it can be recommended as a functional food product for the prevention and treatment of cardiovascular diseases. Diet with amaranth oil may help reduce blood pressure and could serve as an effective alternative to drug therapy in people with hypertension. This investigation also showed that a combination of amaranth oil with a hyposodium anti-atherogenic diet is more effective to reduce the amount of blood cholesterol than just the hyposodium antiatherogenic diet. 5AM Provisions, Inc. has a collection of peer reviewed studies. Click here if you are doing your own research about amaranth. Click On Image to view recipe.